I used Jen's latest Sketch For You To Try for this card. This also doubles as my card for the OCC challenge to use a tag. Although I will probably make a few St. Patrick's Day cards, this is actually the first Easter card to go in my stash for this year. Accessories: Petite Oval Nestabilities and Double Ended Tags (Spellbinders), Cuttlebug (Provo Craft), Markers (Copic), ribbon (Papertrey Ink), brads, foam tape, thread, sewing machine. This is just darling Stephanie! I love the Urban Prairie paper with Riley, too cute!!! Too cute!! 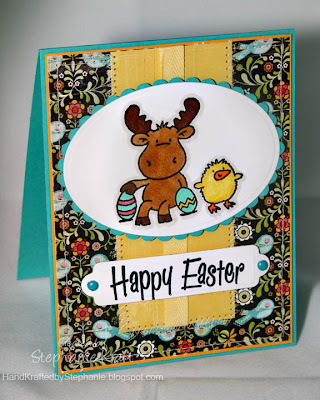 Love this Easter card, love the color combo. totally cute! love that dp!